TheRustedChain - The Blog: "Hey, I know her!" That's what I yelled at the tv when Martha Stewart said, "My next guest today is Anna Maria Horner." And then it dawned on me that in fact, I don't know her at all! I just know of her. Anna Maria is such a warm personality that one can feel like they know her just from seeing her numerous features in blogs, magazines, and interviews. She is a mother of 5 and creator of all things beautiful. Many of you know that I can't sew worth a lick, but boy do her fabrics make me want to! (Maybe I'll get uber creative and make some fabric into jewelry somehow. And yes, I know no one says "uber" anymore, but it was the only word that popped into my head besides Super-Dee-Duper thanks to the Barney video playing in our house 18 times a day.) No matter which line of fabric it is, it's always warm and colorful, refreshing and inviting. 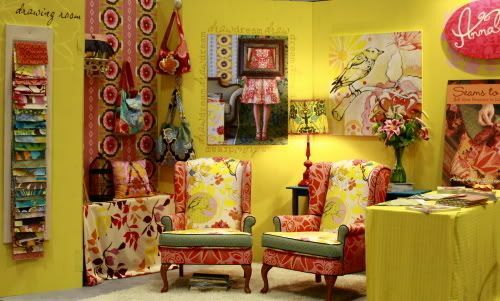 This is a shot from her website of her booth at Quilt Market recently in Portland. And I've decided I'm moving into this space. There's not really room for The Man and The Kids, so I'll be spending time alone here but I'll sneak off to my real home often to see them. I'm sure they won't mind, right? 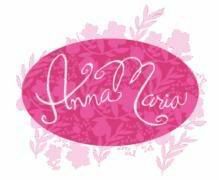 Anna Maria - designer, photographer, blogger, author, and mompreneur extraordinaire. If there is anyone who will inspire the up and coming designer, this is the lady to do it. I LOVE that! That is a pretty fabulous space alright! PS- I still say uber, so there!